Chart No. 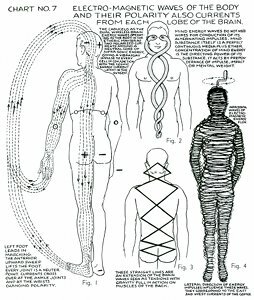 7 - Electro-Magnetic [Electromagnetic] Waves of the Body and Their Polarity Also Currents From Each Lobe of the Brain. Left foot leads in marching. The anterior upward sweep lifts the foot. Every joint is a neuter [neutral] point. Currents cross over at the ankle joints and at the wrists changing polarity. 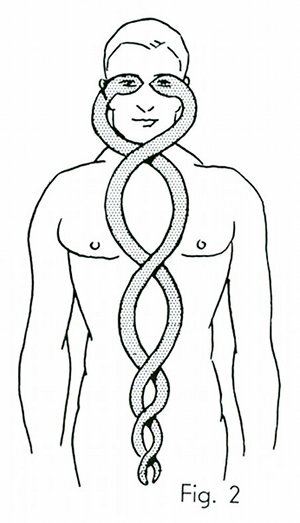 The caduceus as the dual wireless brain energy waves operating in the body in the etheric matter as two polarized currents around a neutral core of supra [super] sonic [supersonic] energy, giving a vibratory impulse to every cell in conjunction with the cosmic energy current latent in the oxygen. Mind energy waves do not need wires for conduction of its alternating impulses. Mind substance itself is a perfect continuous media plus ether. Concentration of mind energy is the directing power of its substance. It acts by preponderance of impulse, impact or mental weight. 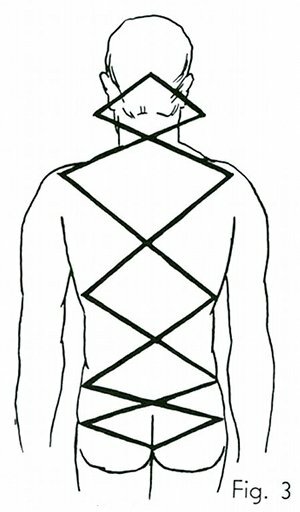 These straight lines are an extension of the brain waves seen as tensions with gravity pull in action on muscles of the back. Horizontal waves electro magnetic [electromagnetic] energy flow. Lateral direction of energy impulses influence these waves. They correspond to the east and west currents of the cosmos.